Christmas isn’t Christmas without the buttery pastry and spicy dried fruit filling of a mince pie. Mince pies are one of the best desserts at Christmas time, they are great warmed with cream and ice cream, wonderful with a cup of coffee and amazing for breakfast! Growing up in my family they were plenty of festive tiffins, tablets and meringues to snack upon which everyone loved, but my favourite was always the mince pie. I loved the spicy flavours and the dried fruit, and the smell! To some people it’s the smell of pine, to others mulled wine, but to me its freshly baked mince pies, that smell like Christmas. ~ should make around 20 (with leftover mince meat). 100 ml of milk, for brushing the top of the pastry with. Pre heat the oven to 180 oC and grease a fairy cake tin. Roll out the pastry till it is about 1cm thick. 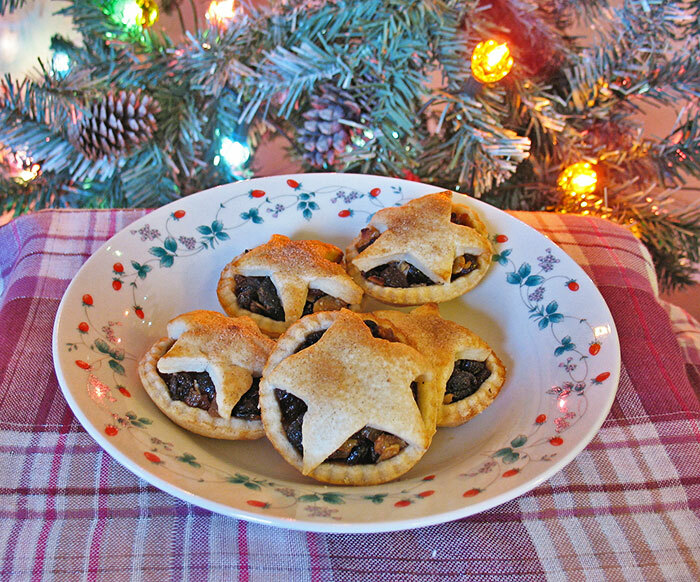 Using a cookie cutter cut out circles, which will form the base of your mince pie, and stars that will form the top. Gently press the circles into the tin, filling each with around 2-3 heaped teaspoons into each pie. Top each pie with a pastry star. After you have completed all the pies, use a pastry brush to lightly cover each star with a little milk. If you have it sprinkle each pie with cinnamon sugar before baking. Leave the pies in the oven for around 15 minutes, until they have turned golden, leave them to cool on a rack for at least 5 minutes. Writing this post on a full stomach is one of the hardest things I have had to do, I just absolutely could not eat another mince pie. Still thinking of the smells and the textures is making my mouth water.